The AmericartUSA™ powered tuggers are the best choice for transporting or moving heavy equipment, materials and supplies that are already on a wheeled base. The AmericartUSA™ powered tugger is a safe and compact solution for moving heavy equipment, materials and supplies that are already on a wheeled base. With the AmericartUSA™ motorized tugs, one staff member can quickly and safely perform the same task that may currently take multiple trips or multiple staff. The AmericartUSA™ powered tuggers frame creates a stable, weighted platform that enhances the stop/start traction and stability for tight maneuvering and transporting of heavy loads. The AmericartUSA™ powered tugs are battery operated and equipped with a self-contained 115V smart charging system. Simply plug the tug into any standard 115V outlet whenever the cart is not in use and the smart charger automatically shuts off when the batteries are full to prevent over charging. Rule of thumb is to keep the units plugged in whenever not in use. 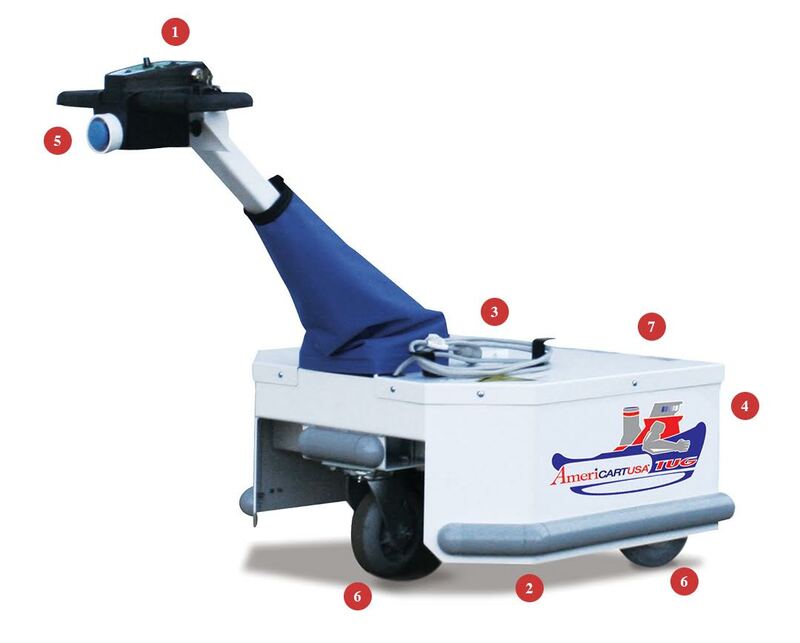 The AmericartUSA™ motorized tuggers have an exclusive safety feature in the Emergency Stop Switch which immediately stops the cart from movement when engaged. 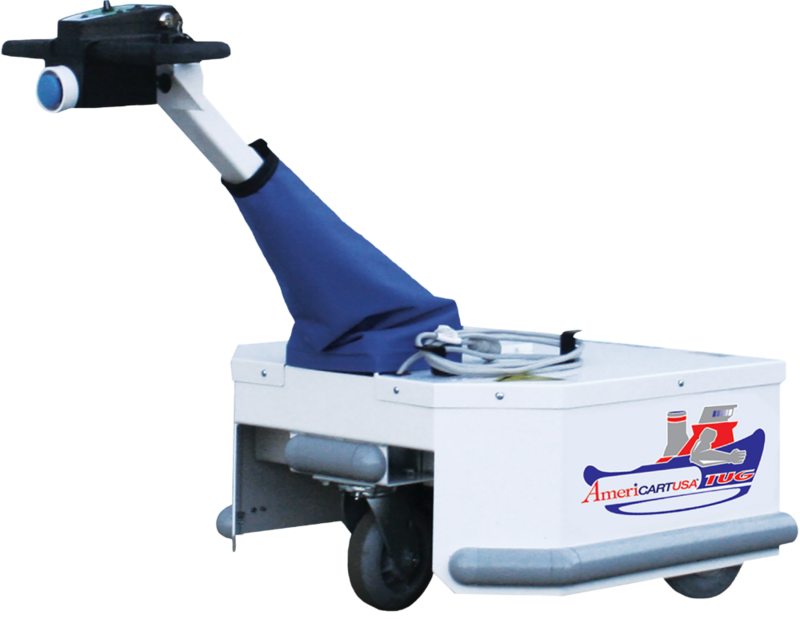 The AmericartUSA™ powered tugs feature a never flat, foam filled 8″ tires, never requiring air refill. The AmericartUSA™ powered tugs have a 1,000lb. towing capacity allowing you to now safely move anything already on a wheeled base that weighs up to 1,000lb. The applications for the AmericartUSA™ motorized tuggers are virtually endless in transporting anything already on a wheeled base. The following are a list of the most common requests: maneuvering linen carts in hotels, resorts and spas, transporting banquet supply and food carts, handling large quantities of CO2 and air tanks, moving heavy luggage and back-room packages, delivering bulk quantities of ingredients from storage to banquet kitchens, transporting boxes from loading docks, delivering copy paper and bottled water to multiple office locations, maneuvering large packages and mail bags to and from mailrooms, pushing or pulling large trash or recycling containers, moving parts and other materials to various manufacturing departments.